Siliguri, Dec. 15: The toy train tracks at Tindharia have been relaid soon and service from Siliguri to Gayabari is set to resume later this month. “We plan to resume the service to Gayabari with a big bang. A special train will be operated from Siliguri Junction till Gayabari (34km) on that day. The date will probably be December 26. 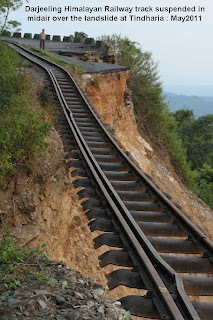 The work of relaying tracks at Tindharia has more or less been completed. We plan to conduct a trial run on the newly laid tracks this week,” Arun Kumar Sharma, the divisional railway manager of Katihar division of Northeast Frontier Railway, said over the phone from Katihar today. A landslide at Paglajhora on NH55 in June 2010 disrupted the services from Siliguri to Kurseong.